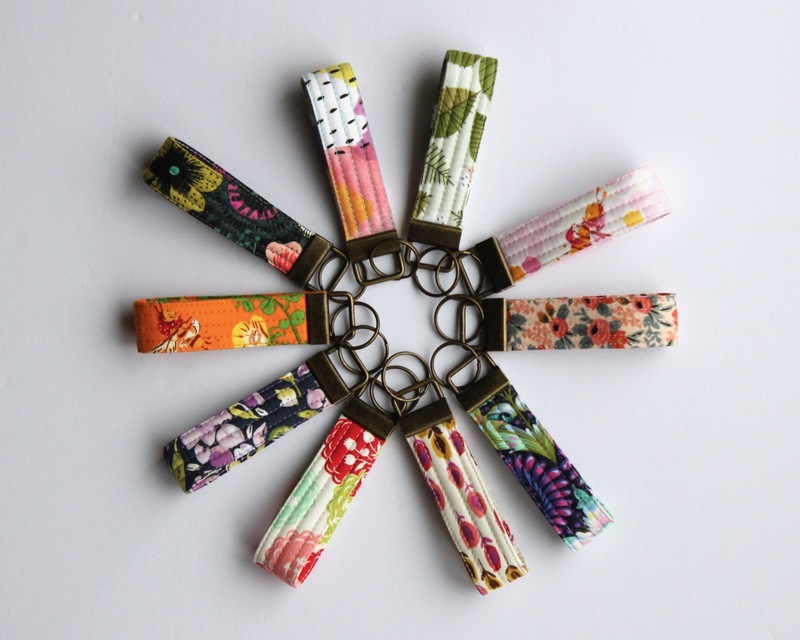 I've got some super cute key fobs to share with you today! I made all of these in about 2 hours a few nights ago and listed them in my shop for sale. I didn't use a pattern or any particular tutorial for these but they're extremely easy so I figure I'll just write down a few instructions incase you're interested! Keep reading to see how I made these and check out more pictures! NEW: You can get the PDF version of this tutorial for $1 in my pattern shop. 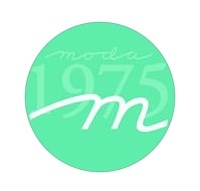 It's printer friendly and easier to view / save on mobile devices. This is great for those who don't want to keep coming back to the blog for the steps. Iron your woven interfacing onto the back of your exterior fabric. Fold fabric in half length wise and press. Open up and fold long raw edges inward (toward the fold you just pressed) and press again. Fold in half with raw edges tucked inside and press. Your key fob should now measure 1" x 8.5" with no raw edges visible. 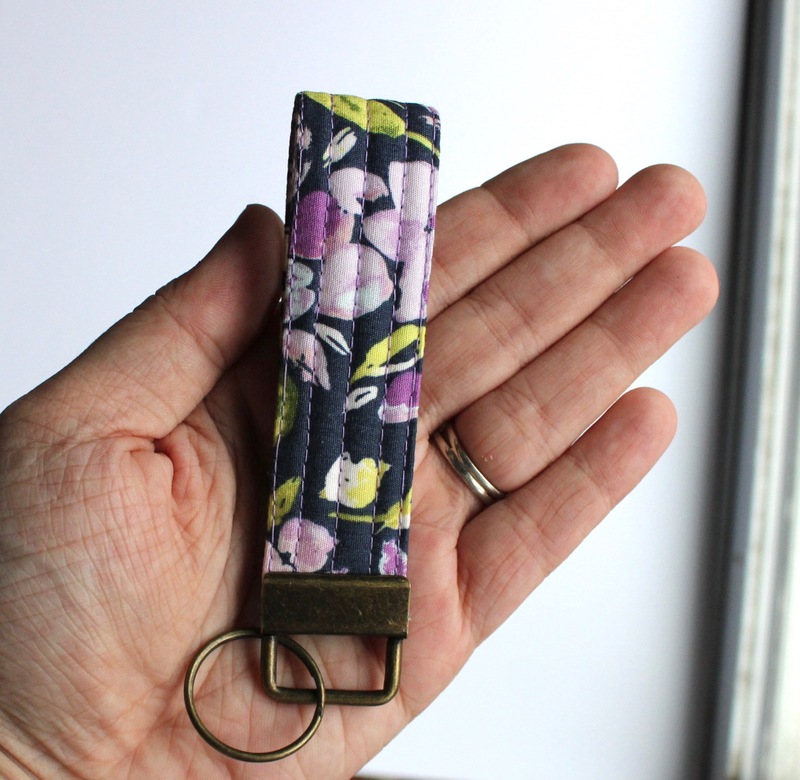 Tuck your soft & stable (or batting) piece inside of your folded key fob piece. Clip or pin the open edge shut. Stitch ⅛" away from both long edges, then ¼" from each edge, and again directly down the center. I suggest a 3.5 or 4.0 stitch length. Fold quilted key fob in half length wise matching raw edges, baste at the bottom to secure. Clamp metal key fob hardware to your quilted fabric piece covering the raw ends. These are really fast and very easy to make. 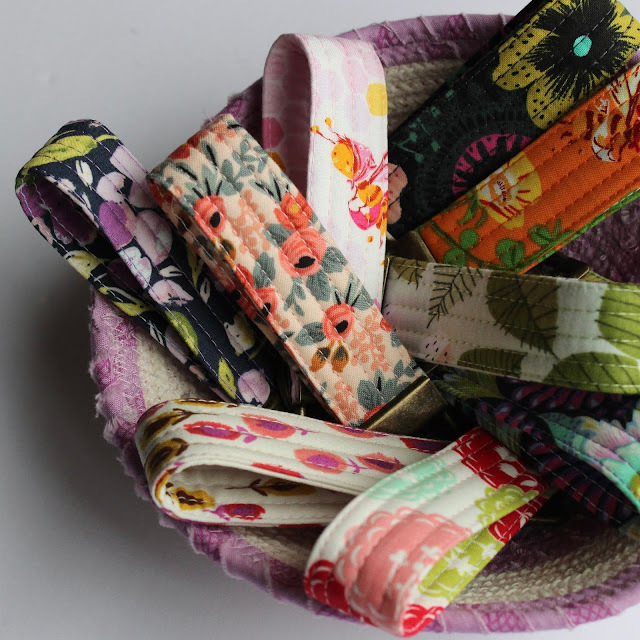 Plus it's a great way to use scraps and make inexpensive gifts people will love! I kept a couple for myself, sent the other to teachers for Christmas gifts, and sold the rest in my shop (there are 3 left I believe - go grab one!). If you make one of these using my instructions feel free to tag me on Instagram (@amistabaker). I'd love to see your creations! Get the PDF download for this tutorial here! If you're looking for an easy Christmas gift this holiday season that will still impress your friends and family, you should definitely checkout the Boxy Clear Pouch by Aneela Hoey. I have made this pattern before as a pattern tester for Aneela, but yesterday I whipped up two of these in the small size in a couple hours as Christmas gifts for my two daughters, then finished hand binding them this morning. I absolutely love the way they turned out! First I'd like to show you the gifts, then I'll show off the version I tested and get onto the review! 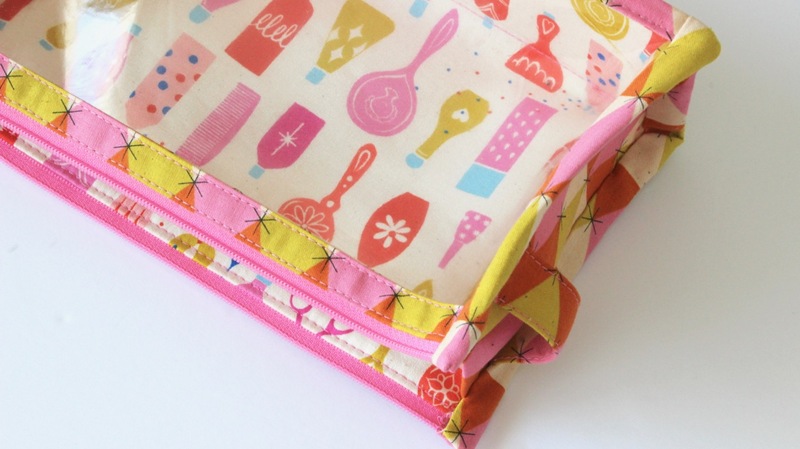 A combination of Cotton & Steel, Sarah Jane, and Dear Stella fabrics were used on both of these pouches. The pink firefly one is for my youngest daughter, Lily, and the other is for my oldest daughter Zoey. Each of them shows off their different personalities and favorite colors. I think they're really going to enjoy them! I used all Cotton & Steel fabrics on this version and a cute piece of twill ruler tape for the pull tab. 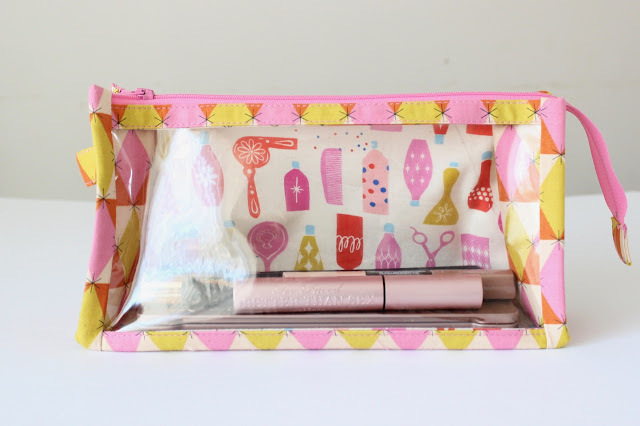 As you can see these pouches (this is the small version) hold quite a bit! 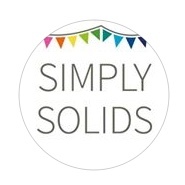 I've got 2 large Aurifil thread spools and 10 Moda mini charms in this one with room to spare! I eventually removed the thread spools and put them back on my rack then continued filling this pouch with my Mini Charm collection. It held 18 with ease!! As always, Aneela's patterns are easy to follow and understand. 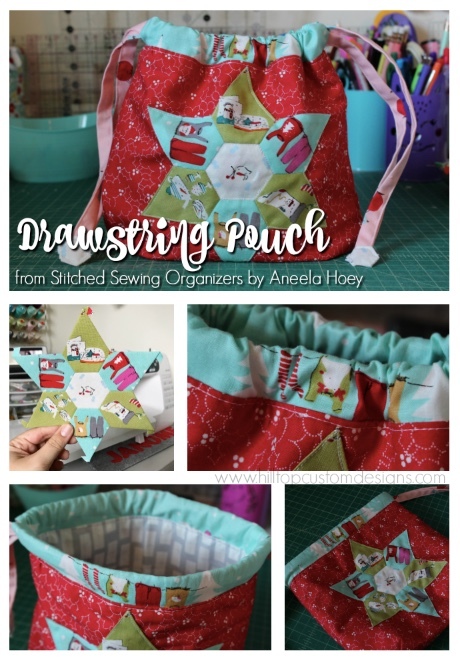 She has great illustrations to help you get a picture of the steps required to complete the pouch and just like the Zip-Up Tray Pouch and Double Zip Box Pouch that I pattern tested for her, her creations are always unique and different from other patterns! Contrary to the fact this pattern and others of hers may seem a bit difficult, they're really not. 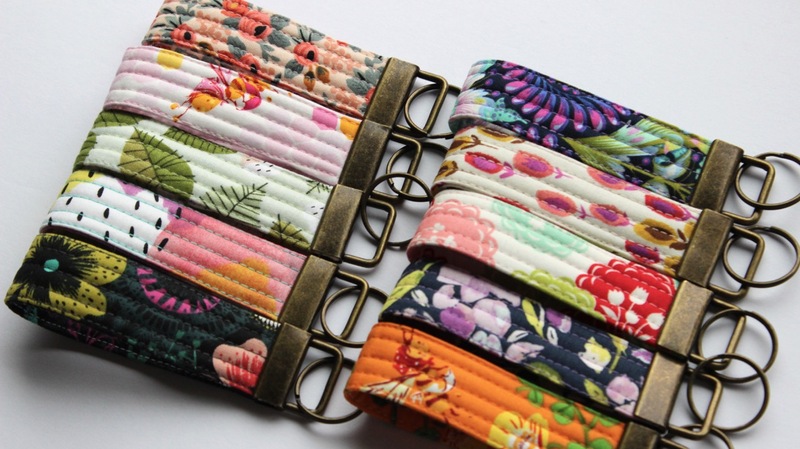 An intermediate sewist could easily complete them and a beginner could do so too! 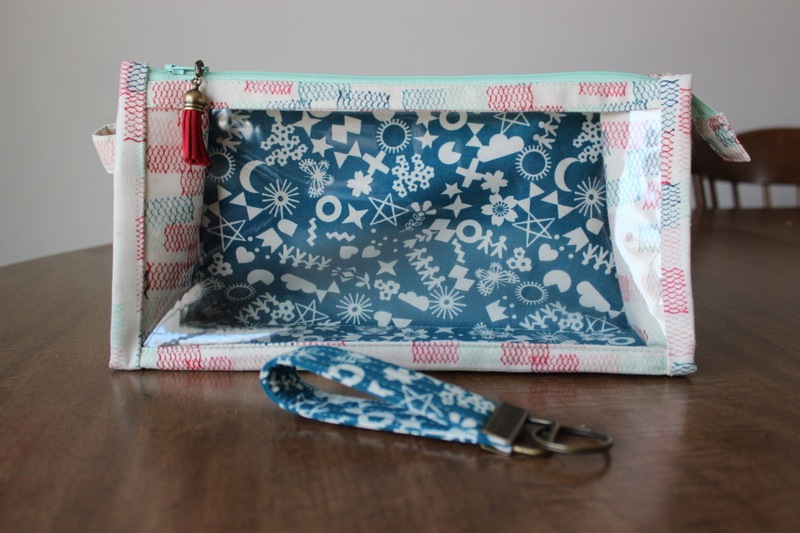 Don't be afraid of zippers and vinyl... this pattern is quite easy to complete! If you'd like to purchase it, click here. The only "difficult" part of this pattern is the hand binding, which really isn't too tough as long as you can do a nice ladder or "invisible" stitch and have the right tools to use. 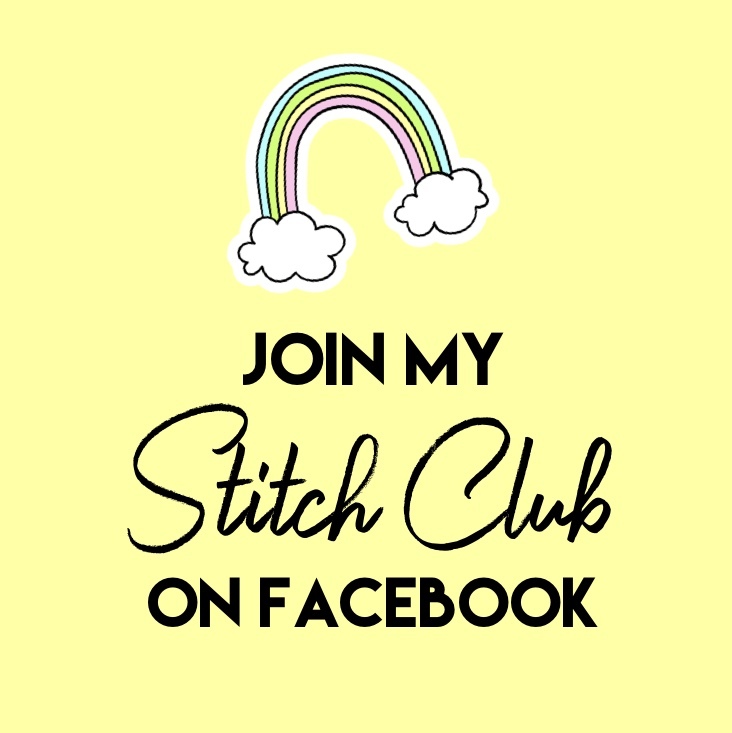 If you're new to hand stitching, checkout some YouTube videos to learn a few stitches. It's easy to catch on to, I promise! I prefer a #10 Milliners needle and 40 wt. thread for strength (especially since my kids will be using these). It took me almost exactly one hour to hand bind two pouches, but thats because I'm a bit slow and like to take my time to make it look as neat as possible. What do you think of it? I have yet to try the large size, because the small is so generous in size already but I would definitely consider making a large one for toiletries while traveling or to hold sewing supplies. 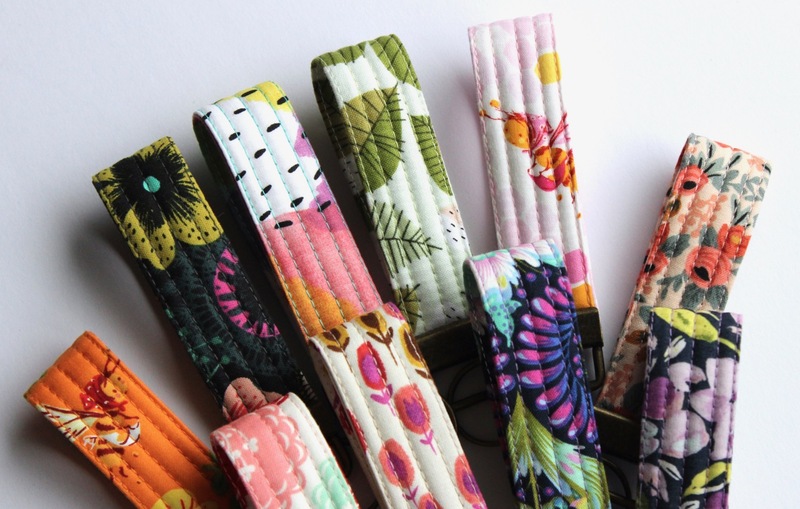 I think this would be extra cute in a short version too... one for binding clips and such! 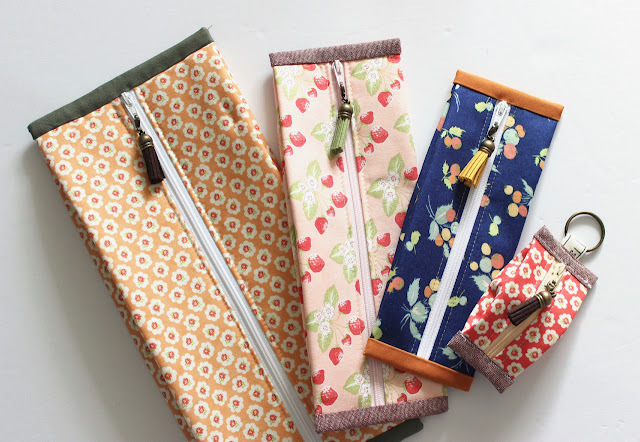 Anyway, thanks for reading and I hope you love these pouches! 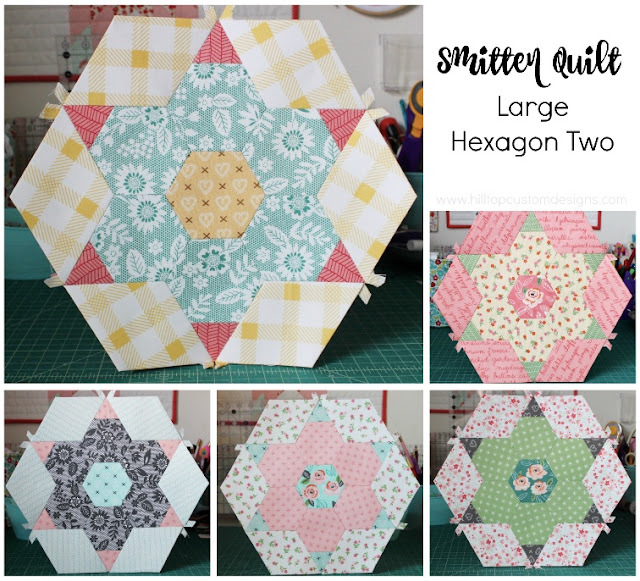 As of yesterday I have officially finished all five of the Large Hexagon Two blocks for my EPP Smitten quilt (pattern by Lucy Carson Kingwell). 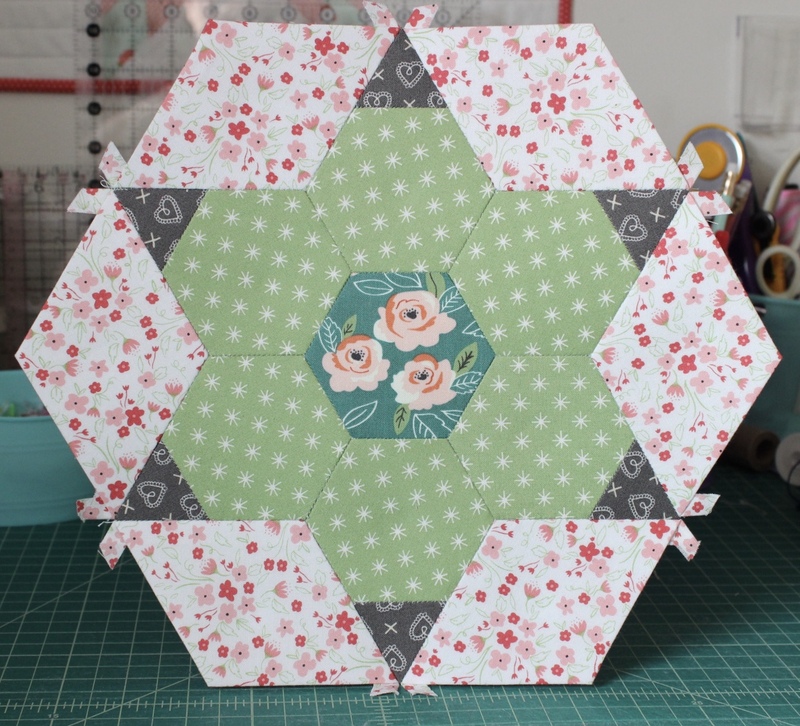 I thought I would share all five blocks here as I had previously done with Large Hexagon One. I am increasingly happy with the way these blocks are turning out using Sugar Pie and Little Miss Sunshine fabrics by LellaBoutique. They are bright, happy, and scrappy in just the right way! I can't wait to see the entire quilt when it's finished, which I am assuming may take me a few more months as I only work on this when I have opportunities to sit down and do some slow stitching.